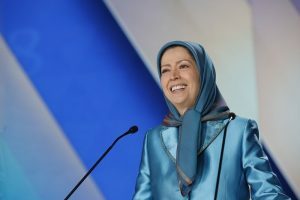 The three-day event was marked by panel discussions about the weakness of the regime and the growing opposition movement, speeches by political figures, government officials, and dignitaries from all over the world, and a keynote address from Mrs. Maryam Rajavi, President-elect of the NCRI. 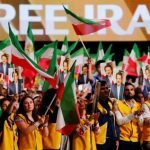 The unifying message from all of these speakers, who ranged from across the political spectrum, was one of hope for a free Iran and support for the NCRI and the MEK. 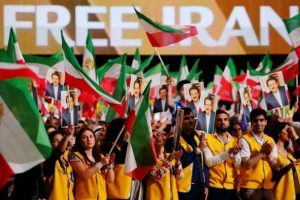 The event also featured videos, celebrations of the cultural history and heritage of the Iranian people, examples of how the resistance is working inside Iran, and delegations of supporters of the resistance movement. Many members of the MEK were in attendance. Early in the day, a video was shown from the perspective of a political prisoner facing execution during the 1988 massacre of political dissidents in Iran. In the summer of 1988, 30,000 Iranians, most of them members of the MEK, were executed by the regime. The video, shot from the perspective of one of these prisoners, counted down the minutes until execution. The Iranian flag played a large role in the day’s events as well, with delegates waving the true Iranian flag, which features the lion and the sun. The regime changed the flag’s center when it took power, but the resistance continues to recognize the traditional flag as the legitimate flag of Iran. “We promise that we will continue our fight to make a free Iran possible,” she vowed. As she spoke, the rest of the delegation solemnly stood behind her holding signs. A small child stood with the youth holding a red flower. The young speaker took a moment to adjust her veil, but when she continued, her voice was strong. Mrs. Rajavi has praised the young people who are currently protesting in Iran and urged them to continue their fight. Delegations from France, Albania, Yemen, Canada, the United States, San Marino, and Arabs opposed to the regime were among those who took the stage during the convention. The delegation from the United Kingdom was large and comprised MPs from both houses and several political parties. A number of notable political figures from the United States from both parties gave speeches as well, including Bill Richardson, Rudolph Giuliani, Newt Gingrich, and Louis Freeh.